Summoned by the Triforce, Link travels to the kingdom of Labrynna. The Sorceress of Shadows, Veran, has used the Oracle of Ages to travel back in time and build a Black Tower that will blot out the sun and start an age of darkness. 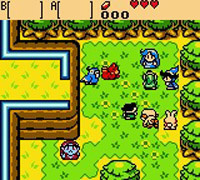 Using the Harp of Ages, Link must travel between the past and present to find the eight essences of time in the dungeons and return them to the Maku Tree. Link must collect the keys and items, and defeat the boss in each dungeon. You can also collect Rings that will give Link new abilities. Link this game to Oracle of Seasons to unlock the conclusion to the Oracle stories. One of the bosses is a large stone head named "Head Thwomp", named after the stone head enemies from the Mario series. If you clear The Legend of Zelda: Oracle of Seasons and use the password in Oracle of Ages, the boss of the Black Tower is changed into a tower challenge where Link has to climb up while jumping over fireballs that roll down. At the top of the tower, you rescue Zelda. This section appears to have been inspired by the arcade Donkey Kong.